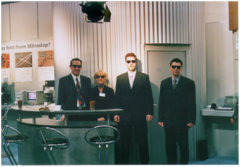 First thought – a still from a Tarantino movie, but on closer observation the team from Resultec are revealed. Every month on the Linkam blog we will be profiling our business partners: first up, one of our German distributors, Resultec. Started in Cologne in 1985 by Dr Manfred Feustel and his brother Michael, the company specialises in the development and sale of products for microscopy, with particular expertise in spectroscopic techniques. Early on, in 1990, Manfred had designed and developed an ellipsometer working in the UV-Vis spectral range and later developments saw the introduction of a minimum ATR (Attenuated Total Reflectance) cell for small microlitre volumes of sample. In 2009 they added the Rheonaut to their portfolio, a product that couples FTIR spectroscopy with rheology. Checkout their website for details of these products. Now based in Illerkirchberg in southern Germany and one of the major Linkam partners in the country, they have been excellent in promoting Linkam products during the past 15 years, helping to distribute our products throughout Germany, Austria and Switzerland.